Australia’s World Cup hopes received a further boost last night with star batsman David Warner making a dominant return to top-level cricket with 85 from 53 balls in the Indian Premier League. From the very start of his knock for Sunrisers Hyderabad, Warner looked as if he had never been gone. In the second over of the innings he played two extraordinary strokes which are only possible for truly elite batsmen. Former Indian leg spinner Piyush Chawla delivered two well-directed, flat googlies which were headed for the top of Warner’s off stump. The left-handed Aussie gave himself just enough room to slice both deliveries past cover for four. The veteran spinner, who has played 218 matches in this format, looked utterly stunned. Chawla’s apparently muddled mind, as a result of these two phenomenal strokes, was evident when the next ball he called for an awful DRS review of an LBW shout against Warner that pitched 20cm outside leg stump. Soon after that Kolkata quick Prasidh Krishna dropped slightly short and Warner rocked back to hammer a pull shot over mid-wicket for four. Any concerns Warner might struggle to re-adapt to high-level cricket, perhaps struggling against extreme pace or world class spin, were promptly scotched in the following overs. First he looked at complete ease against arguably the world’s fastest bowler, Lachie Ferguson, driving the Kiwi quick for four in his first over. Then he clubbed three boundaries in the space of four balls from two of the star spinners of world cricket, Kuldeep Yadav and Sunil Narine. By this point it was clear Warner had lost nothing during his 12 months out of international cricket due to the ball-tampering scandal. A few minutes later he was confronted by another bowler with intimidating pace in West Indian Andrew Russell. First he absolutely nailed a cover drive for four. Then he upper-cut Russell’s next delivery over third man for six to bring up his half-century from just 31 balls. Perhaps no shot in Warner’s innings, though, was more impressive than what he unleashed from the final ball of Kuldeep’s second over. The left arm wrist spinner landed a leg break on a good length and Warner, somehow, went deep in his crease, got underneath it and bludgeoned it for six over long on. By the time Warner reached 85, with four overs left in the innings, he looked bolted on for what would have been the seventh ton of his T20 career. It took a sharp catch by Robin Uthappa at cover to deny Warner this milestone. That ended a truly stunning comeback knock from the 32-year-old, who was comfortably Australia’s best white ball batsman before being banned. It was arguable that ODIs had become his best format and that he was the second best ODI batsman in the world after Indian Virat Kohli at that point. In Warner’s last 50 ODIs he averaged 56, racked up 11 tons, and scored at the scorching strike rate of 106. He has been widely expected to slot straight back into Australia’s World Cup XI, despite heavy competition due to the good form of Usman Khawaja, Shaun Marsh and Peter Handscomb, and the impending return of Steve Smith. 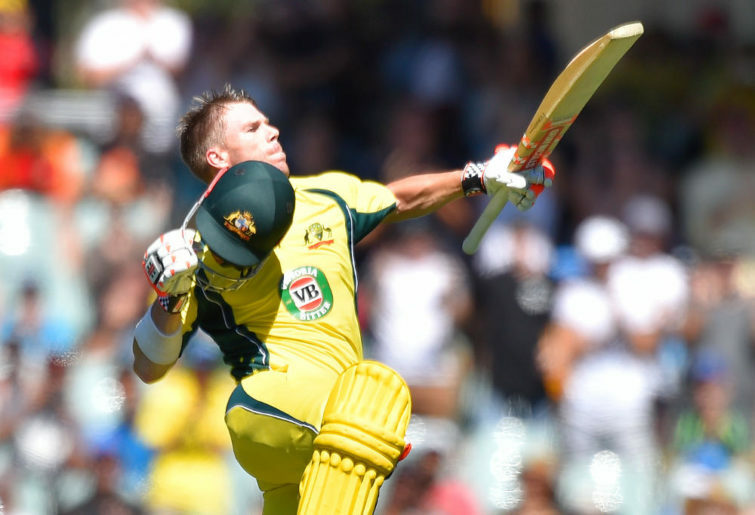 Warner’s performance last night, while admittedly just one knock, suggests he could still be Australia’s potential trump card with the blade in the World Cup in England this June.